No doubt you’re here because you’re looking for the Best Triple Strollers for 2019. 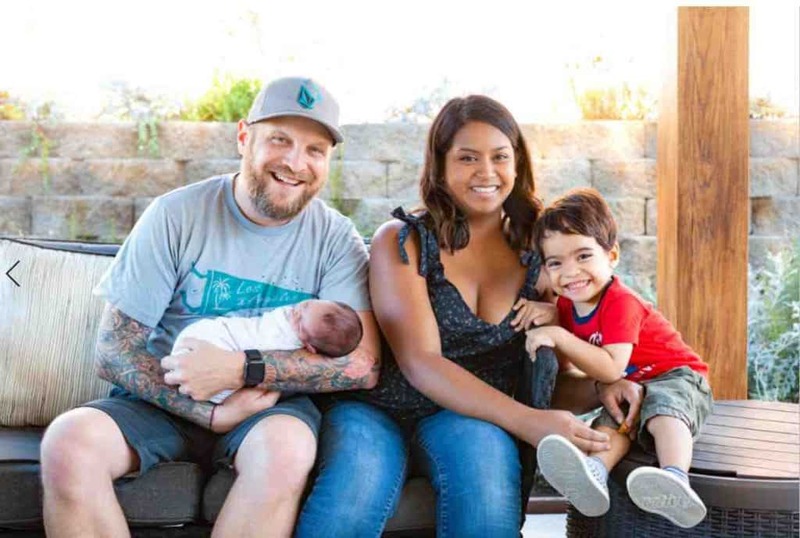 Whether you’re looking for your infants, toddlers, or even your triplets, we’ve got you covered with our “Best Of” List for 2019. Not all parent have triplets. Some have two little ones with a third slightly older kid. The Joovy Big Caboose is a great choice for such families. It has two full-fledged seats with canopies and a bench for the older kid to sit on. 2) Very good carrying capacity. This triple stroller has a payload of 125 pounds and yet, it weighs just 32.3 pounds and it foldable. 3) The two front seats are large with adjustable footrests, 5 point seat-belts, removable hoods, food trays and recline adjustment. 4) The front seats have universal car seat adapters. This saves quite a bit of hassle and even a bit of cash. 5) Large basket below the seats has enough room for kids’ supplies. 6) Very easy to carry (lightweight). Can be hauled in and out of cars without much effort. Narrow design makes it easy to steer through doorways, corridors and so on. 7) Fairly straightforward assembly. All wheels have sealed bearings to make it easy to maneuver the stroller. Parking brake. 8) Comfortable ride, thanks to the all wheel suspension. 1) It’s big and difficult to push around when fully loaded. The tires are small which means that you’re going to have to use quite a bit of strength to go over anything that is not smooth. 2) It is fairly compact but still, folds at a slight angle – not completely flat. 3) Not suitable for triplets. This heavy duty triple stroller can hold three kids weighing up to fifty pounds each. So, it’s very suitable for slightly older or heavier children. 1) Very strong and very safe. The LX3 features a SafeBreak system that engages as soon as the person steering the stroller is separated from it. This minimizes risk of accidents. 2) The ComfortPush system disengages the brakes whenever the caretaker applies forward pressure on the handle bar. This prevents fatigue and makes it very easy to push and steer this heavy stroller. 3) The LX3 comes equipped with the largest wheels in the industry. These provide extra manoeuvrability and enable the stroller to go over most bumps and irregularities without breaking a sweat. 4) The stroller uses hard wearing, easy to clean fabrics to ensure longevity. 5) The extra large canopy shields against harmful UV Sun-rays without eating into headroom. 6) Large storage area to accomodate childrens’ supplies such as diapers, wipes, bottles, food, medicines and toys. 7) I year limited manufacturer’s warranty has the buyer covered in case of any mishaps. 8) Even though the stroller is huge, it’s only 22.5 inches wide, enabling it to go through all doors. 9) Shoe-less braking components are highly efficient and do not require frequent replacements. 10) Fairly affordable considering the amount of goodies it offers. 1) Very long. Length is just under 72 inches, or approximately six feet. 2) Single canopy for all three seats. No individual seat hoods. 3) Easy to assemble and fold but you cannot ignore its massive size even when folded. May not fit in the trunks of smaller cars – please assess carefully before ordering. This is the Mercedes-Benz™ of triple strollers. The Peg Perego Triplette is probably the last word in Triple stroller technology. It is extremely well built, abuse-friendly, comfortable and comes with a diaper bag so stylish that it could pass off as an oversized fashion accessory. If you’re looking for a luxury stroller, this is your best bet. One of the signature features of this is that each pop-up seat can be folded both off and on the chassis. The seats can also be mounted in either a forward or backward facing position according to your convenience. Each seat has a grab/safety rail (with padding) and premium cushioning to ensure that you and your toddlers can move about in luxury and style. The seats have hoods to protect the passengers from the elements and come with roller-coaster like, x-shaped safety belts. Every pop-up seat has a reclining backrest and a footrest that can be set to two positions. Lots of space underneath the pop-up seats to store all baby stuff and the free diaper bag. If you’re in the market for a strong, no-nonsense triple stroller, look no further than the Foundations Trio Sport Tandem stroller. This model is popular among baby-sitters as well as parents because it does the job without hurting the wallet too much. 1) The stroller can ferry around 3 kids up to 40 pounds each plus their supplies. This puts it’s payload at a very convenient 125 pounds. 2) The stroller has been designed to go through standard doorways. This means that you don’t have to assemble it outside. You can put it together inside, load up the kids and pass through doorways and corridors without hassle. 3) Seats can be set upright or in the recline position depending upon the preference of your children. Moreover, the stroller is easy to fold and can be loaded onto the boots of most family cars. The product dimensions are 48 x 22 x 18 (inches). 4) Each seat comes with a canopy to protect against the elements. 5) Easy on the wallet. 1) Not exactly easy to steer. The weight of the stroller is about 59 pounds. If it loaded to the brim (approximately 125 pounds), the total weight goes up to 180+ pounds. So you’re really going to have to push – especially if the terrain is uneven. Steep slopes, bumps, potholes and rough surfaces are going to be somewhat challenging. 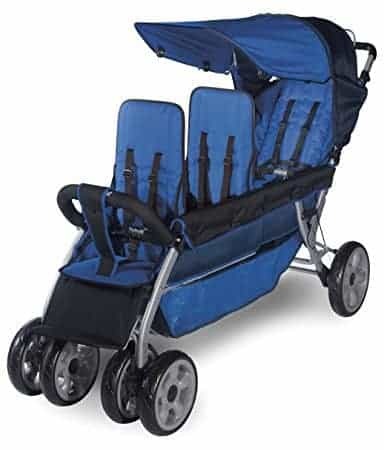 2) This triple stroller is rugged, not refined. It may squeak and rattle a bit and the ride is not soft. Bumps will be felt so you have to go real slow over anything that is not completely smooth. 3) No rain cover included – only standard canopies. 4) The stroller is quite long (approximately 4 feet in length). This makes it difficult to maneuver. This stroller aims to strike the right balance between durability and mobility. It is built using high strength tubing that makes it lightweight yet hardy and easy to steer. 1) The Trio Sport Tandem has a well designed handle. Very comfortable to hold and steer. 2) The adjustable seat canopy provides adequate protection from snow, dust and UV rays. 3) The heavy duty rubber wheels are built to withstand everyday abuse. They also help in providing a somewhat pliant ride. 4) Good for three same or even differently sized children. 6) Standard width ensures that it goes through almost all doorways. 7) Very easy to assemble. 8) Available in a funky lime green color. Not only does this set you apart, but also makes the triple stroller more conspicuous on the road. 1) Rides a bit hard. Not exactly the softest suspension. 2) It gets heavy when it’s fully loaded. Steering it is a bit difficult. Tends to go towards one side at times. You may have to counter steer to keep it in place. 3) Storage space could have been better. Child Craft is a highly popular and trusted childrens brand – both in and outside of the USA. It’s been around for over six decades, and chances are, even you used Child Craft manufactured toys/books/accessories as a kid. 1) Can easily accommodate three children weighing up to 40 pounds each. 2) The stroller is equipped with a canopy to protect children from harsh sunlight. 3) The seats and canopies are lined with easy to clean fabrics. Every seat has a 5 point safety harness and recline adjust for the comfort of your kids. 4) The popular three-in-line assembly helps to maximize occupants’ line of visibility and encourages them to observe and interact with their environment. This arrangement also makes it possible to go through narrow openings. 5) The shock-absorbing rubberised wheels are durable and of a decent size to enable them to go over bumps and other minor obstacles. 6) The stroller features a simple yet effective pull-up and fold mechanism that allows it to fold quickly, efficiently and fairly compactly. 7) The brakes engage as soon as you release the handle-bar of the stroller. This is quite similar to the luggage trolleys at airports. 1) Quality issues here and there. 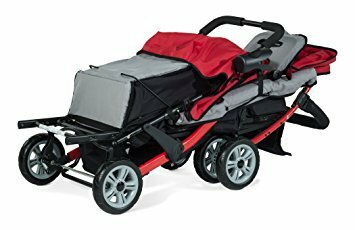 The brakes do not disengage completely at times and this makes it difficult to push this already heavy (loaded) triple stroller. 2) As mentioned above, the brakes engage as soon as you let go of the handle. While this makes the stroller very safe, it makes it that much harder to push. Your hands may get tired after holding the handle bar down for a while. 3) The storage basket has edges on the sides and is oddly shaped. It has a slope – this may cause all kids’ supplies to gather at one place and even tip over the sides. Moreover, the slope compromises the ground clearance of the stroller. Well, technically this is a double stroller but it can be converted to accommodate three kids by purchasing an X toddler seat. It works very well for parents who currently have two children but are planning to have another one a couple years down the line. It’s also suitable for those who usually take care of two kids but have an occasional third visitor. 1) This stroller is very easy to fold. The design has been recently upgraded to make it more compact and easy to use. 2) The Duo X features top of the line features such as automatic locking, adjustable footrests, front bars, signature Ex-tendable canopies, head huggers and rain covers. 3) The seats are big and comfortable. The arrangement is ideal for a pair of twins plus one toddler or three kids of the same size. This stroller can be used right from birth. 4) Makes use of eco-friendlier materials and leaves a smaller carbon footprint. 5) The 10 inch air tires enable it to go over uneven pathways with relative ease. The ride is very comfortable. 6) The handle bar can be adjusted to the height of the person pushing the stroller. 7) Looks quite good in the standard dual mode. 1) This is not a conventional design. The two seats are side by side and hence, the stroller will not go through narrow doorways. You’ll have to fold it and assemble outside if your door is not wide. Stroller width is more than 31 inches with canopies attached. Which is about 8 to 10 inches more than average. Folds easily though. 2) While the air tires are much bigger and better than small rubber tyres, you may end up having a flat if you’re not careful. Also, the way the stroller is designed to fold, you can’t really push it down to make it go over bumps. You’ll have to exercise caution and opt for a smoother path. 3) The X toddler (3rd child upgrade) seat looks and feels a bit awkward – almost like an afterthought. I feel that it eats into the side legroom for the kids seating at the bag. 4) Slightly expensive. The fact that you’ll have to pay extra for the X toddler seat makes the price tag even more hefty. The storage space is not at par with the competition. As the title suggests, this one features four seats but it offers stupendous performance and is priced lower than some popular triple strollers. The extra seat can be used for one of your kids’ friends, their favorite toy or simply supplies. 1) 1 Year Childcraft Warranty puts buyers at ease. This stroller has no reported flaws. Almost an impeccable record in terms of quality. A very viable and affordable option for large families and child care facilities. 2) Every seat has a recline adjustment, a five point harness and a sun canopy. Moreover, 4 children weighing up to 40 pounds each can be seated comfortably in the stroller. 4) Large Rubberized Wheels absorb shocks and provide a decent ride. 5) The brakes engage as soon as the parent/guardian lets go of the handle. 6) In-line stadium design provides good visibility to children. 7) Lightweight construction. The stroller has a carrying capacity of 160+ pounds yet it weighs only 34 pounds. Not much at this price range. Could have been easier to steer. 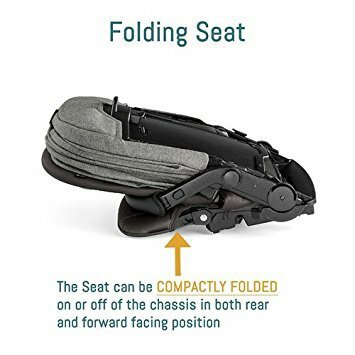 A more compact fold would have been appreciated. Sun canopy gets pushed back in windy conditions. Wheels are not suitable for deep snow or sand. Also, it’s a bit wide but that is expected as it has two rows or two seats in a side-by-side arrangement. Really, we’re nitpicking here. The Childcraft Quad Sport is definitely a good buy. It is not exactly a triple stroller – it’s much more than that! Recommended! 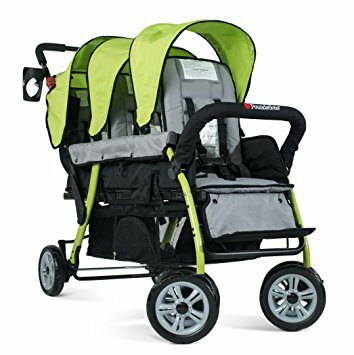 Again, this model is for 4 kids but it too is priced precariously close to popular strollers and offers very good bang for your buck, not to mention a competition-whooping, best in class 3 year warranty/guarantee. It is designed for children aged 6 months and above. Features an in-line stadium seating arrangement and needs next to no assembly. Dimensions: 43 x 33 x 47 inches (L x W x H). 1) This Angeles stroller is equipped with No-roll technology. You can park it on inclines without fear. 2) Highly effective comfort grip breaking system. 3) Manufactured using light yet sturdy steel tubes. 4) High quality fabrics repel water and are resistant to fading. Will not show its age even after 2-3 years of usage. 5) Padded seats are recline-adjustable and feature ample padding for added comfort. 6) Every seat can accommodate a child weighing not more than 40 pounds. 7) Lots of storage space. 8) Manufactured in compliance with ASTM F833-07A safety standards. 9) All terrain tires are good for any surface. (Take this with a pinch of salt though). Might caus problems on snowy/uneven surfaces. 1) Weighs 77 pounds. Will weigh close to 240 pounds if fully loaded. Will take some degree of effort to maneuver despite good tyres. Still, it steers easier than many lighter and more expensive models. Overall, we can’t say enough GOOD THINGS about this unit! The Angeles 4 passenger Bye-Bye stroller takes value for money to a whole new level. It is a proven model that makes truckloads of sense. The 3 year warranty makes puts it in an Elite league. Which Triple Stroller do YOU Prefer? Not everybody is going to need a triple, or even a quad stroller, but for those who do – they’re live savers!